Political cartoons are rarely covered in graphic design histories. 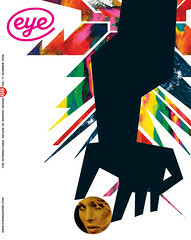 The reason may have something to do with the debatable notion that graphic design is essentially type-driven and illustration and cartoon exclusively image-based. The Art of Ill Will attempts to fill this vacuum with an overview and generous collection of many well known images. These include work by Ben Franklin, the first American political cartoonist, in the late eighteenth century; Thomas Nast and Joseph Keppler from the late nineteenth; James Montgomery Flagg and Louis Raemaekers from the early twentieth; all the way up to Garry Trudeau and Jules Feiffer. The difficulty with any anthology featuring vintage cartoons is explaining context, yet some of the older images in this book are perfectly understandable and even still relevant. Those protesting war are the most universal: for instance, Robert Minor’s ‘Army Medical Examiner: At Last the Perfect Soldier’ (1915) showing a huge headless man being given the okay by the army doctor. Herblock’s ‘It Looks Darling’ showing an anthropomorphic H-bomb with a sinister face talking down to a perplexed Uncle Sam still rings true. The least timeless and interesting are cartoons of US presidents. While the caricatures may be funny, understanding them demands specific knowledge of the times. Nonetheless, while some of the late nineteenth-century cartoons, such as Frank Beard’s anti-immigration commentary, ‘Columbia’s Unwelcome Guests’ (1885), are helped by context, the chromolithographic drawing is actually startling enough to attract attention. Dewey organises the cartoons chronologically according to theme, starting with Presidents; Wars and Foreign Relations; Ethnic, Racial and Religious issues; Local and Domestic Politics; and Business and Labour. Predictably, a great qualitative disparity exists between the older, more academically rendered cartoons and the looser contemporary ones, such as Kirk Anderson’s ‘Early Central American Free Trade Agreement’, drawn in goofy Rocky and Bullwinkle style, or Nate Allen’s awkwardly crafted cartoon about clerical pederasty, which appears ruefully naïve. 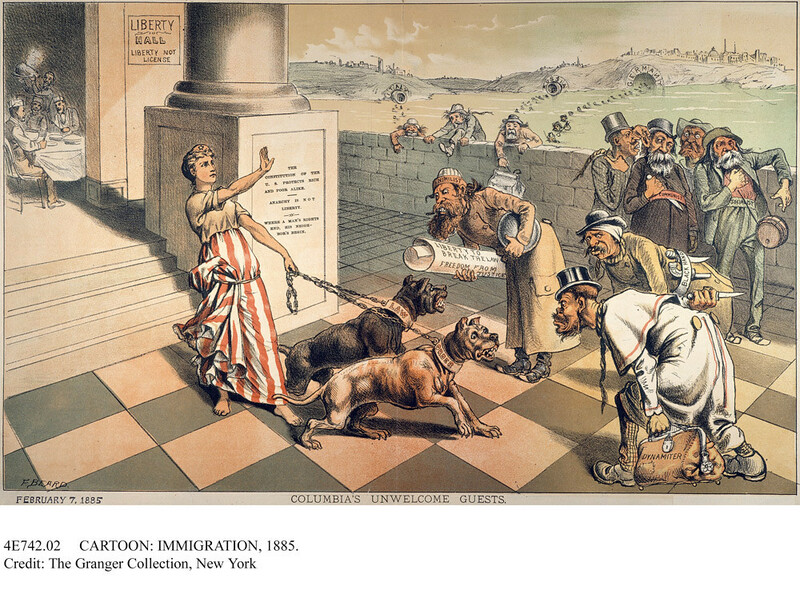 Top: Frank Beard’s 1885 cartoon ‘Columbia’s Unwelcome Guests’, from The Art of Ill Will, expresses the popular fear that an ‘open-door policy’ would encourage the undesirables of Europe – anarchists, socialists, syndicalists – to import their evils to America.